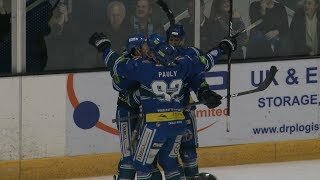 The Genting Casino Coventry Blaze were involved in another goal filled game with the Guildford Flames at the Skydome Arena, ending in a 1-2 sudden-death shoot-out victory for the visitors and a final score of 5-6. 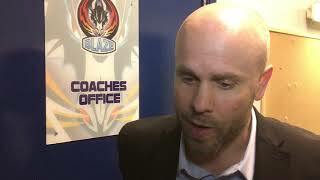 For the second night running, the Blaze were forced to fight back from an early deficit after Calle Ackered and Jamie Crooks put the Flames 0-2 ahead, 5-on-3 and 5-on-4 at 3.53 and 4.57 respectively. Shawn Pauly (6.23) and Tim Crowder on the powerplay (7.11) tied things at two before a second for Blaze man of the match Pauly made it 3-2 (16.08). Just 30 seconds later, another goal came for the Flames through T.J. Foster (16.38) to end the first period 3-3. Surprisingly given the free scoring throughout Saturday and to begin Sunday, there was just a single goal in the second to give Guildford a 3-4 lead. Brett Ferguson registering (31.46) before former Blaze forward Ben Davies made it 3-5 early in the third on the powerplay (43.53). As has become common over recent weeks, there was no quit in Coventry though as Dillon Lawrence (49.51) and then Luke Ferrara (54.40), his 8th straight home game with at least a point made it 5-5, sending the game to 3-on-3 overtime. Despite both teams having short chances on the powerplay in the additional 5 minutes, there was no game winner, sending it to a shoot-out. With Ian Watters and Alex Nikiforuk being the only scorers through five shots, it went to sudden death where Flames’ Jamie Crooks stepped up to take the extra point for the Flames leaving both teams with three points over the back-to-back weekend.